Elon University is the nation’s premier student-centered learning environment, preparing graduates to be the ethical leaders the world needs. Elon students are ambitious, curious, and compassionate, inspired to be big thinkers and creative problem solvers. 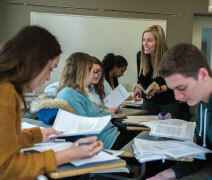 The University’s 6,196 undergraduates enjoy the benefits of a liberal arts and sciences university, forming strong bonds with faculty and staff mentors. The four-year graduation rate of 81% ranks in the top 7% of more than 1,500 US colleges and universities. Elon is one of only seven private universities in the US with accredited schools of business, communications, education, law and health sciences, plus a chapter of Phi Beta Kappa, the nation’s oldest and most prestigious academic honor society. Elon sends more undergraduate students to study abroad than any other master’s-level university in the nation. Seventy-eight percent of graduates have at least one international study experience, often combined with internships, research, or service. In addition, Elon’s Study USA program includes opportunities to study in Los Angeles, New York City, San Francisco, and other locations. Elon is among the nation’s top universities for producing Fulbright Student Scholars and Peace Corps volunteers. Elon earns top rankings for community service by the federal government’s Corporation for National and Community Service. In addition, 89% of students complete internships, 49% of students hold at least one campus leadership position, and 23% of students work with faculty mentors on undergraduate research projects. The University’s engaging intellectual climate is distinguished by supportive and collaborative relationships that promote personal growth. Students live in eight distinct residential neighborhoods designed for various stages of their college career. 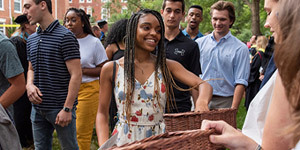 The goal is to create a seamless academic, cocurricular, and residential experience that engages students throughout their time at Elon and beyond. More than 280 student organizations provide a rich array of opportunities to get involved. Student Professional Development Center counselors work with students to create personal development plans, résumés, and strong networking skills. The robust Elon Network of employers, alumni, and parents provides connections to internships and career opportunities. Elon leads the nation in the 2019 U.S. News & World Report ranking of the academic programs that “focus on student success.” U.S. News also ranks Elon #1 among Southern master’s-level universities, with #1 rankings for undergraduate teaching and innovation. The Princeton Review ranks Elon among the nation’s 381 “best colleges” and the #1 “best-run college.” Bloomberg Businessweek ranks Elon among the nation’s top undergraduate Business, Marketing, and MBA programs. Kiplinger’s Personal Finance magazine names Elon a “best value” private university. Elon’s historic 656-acre campus in central North Carolina is designated as a botanical garden and includes the 56-acre Elon University Forest, a land preserve and natural area for scientific research, and Loy Farm, a center for environmental research and sustainability that includes a solar farm. Elon is a member of the Colonial Athletic Association, and the Phoenix compete in 17 intercollegiate men’s and women’s sports in NCAA Division I (FCS football). In addition, Elon offers 18 intramural and 21 club sports. Elon is an academic community that provides the right balance of challenge and encouragement, helping students discover the ambition to seek something great and the courage to achieve it. Elon is a university with a powerful trajectory—ever on the rise and always striving to achieve higher levels of excellence. The best way to experience Elon is to see it yourself! Go to elon.edu/visitelon to schedule a visit. For application information, visit elon.edu/apply.